Why write this book? 2. Analysis of process improvement and origin of impinging streams. 3. Classification and configurations of impinging-stream reactors. 4. Single-phase impinging streams. 5. The behavior of a single particle. 6. The behavior of a multiparticle system. 7. Heat transfer and drying. 8. Combustion processes. 9. Solid-liquid processes. 10. Solid-gas processes. 11. Liquid-gas processes. 12. Liquid-liquid processes. 13. Scaleup and correlation of the hydrodynamics, mean residence time and holdup of impinging-stream reactors. References. Index. Impinging streams is a unique and multipurpose configuration of a two-phase suspension for intensifying transfer processes in heterogeneous systems, viz. gas-solid, gas-liquid, solid-liquid and liquid-liquid. The essence of the method lies in the collision which results from bringing two streams of a suspension flowing on the same axis in opposite directions. Following the impact of the streams, a relatively narrow zone is created, which offers excellent conditions for enhancing the heat and mass transfer between the phases in the suspension. The following processes are considered in the light of the method of impinging streams: drying of particles, solid-solid and gas-gas mixing, absorption and desorption of gases from liquids, combustion of gas and coal, calcination of phosphate, creation of emulsions, liquid-liquid extraction, dissolution of solids, ion exchange, dust collection and granulation as well as evaporative cooling of air. Additional aspects considered in the book are: power input in performing the above processes, heat and mass transfer coefficient and its correlation, mixing properties of impinging stream reactors, residence time of the particles in the reactors, scale-up of impinging-stream reactors with respect to pressure, drop, hold-up and mean residence time of the particles as well as the heat transfer. 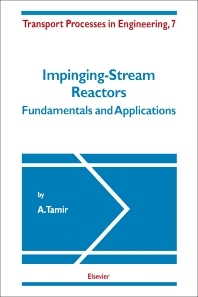 The aim of the book is to review the state-of-the-art in the field of impinging streams, to present results of theoretical and experimental research, and to stimulate research and industrial application of the method so that reactors employing impinging streams will become a common tool in chemical engineering and other disciplines of engineering. The major conclusion of this work is that almost any process in chemical engineering can be conducted by impinging streams, resulting in higher efficiency and less power input in comparison with conventional methods.